5 Not To Be Missed Limited Edition Christmas Packaging For All Beauty Lovers! Christmas is a season of giving and appreciation. Who doesn’t love receiving gifts? Other than receiving, one of the best gifts in life is the gift of giving (geddit?). This holiday, what better way to express your love and appreciation for your loved ones than to present them with a beautifully packaged gift sets? Here’s everything you need to know about some of the limited-edition collections available in the market right now, so get your pens ready and add them into your Christmas wish-list. 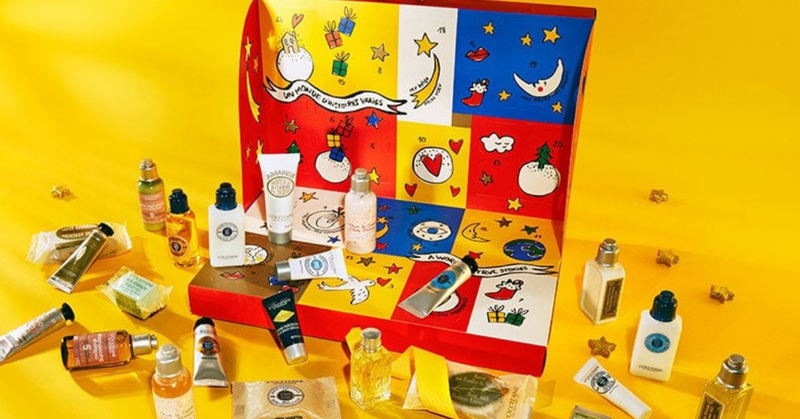 L’OCCITANE’s much-loved beauty Advent Calendar is back for 2018. This whole packaging is illustrated by the fashion house CASTEL BAJAC Paris.This collection features 24 of most loved products such as Shea Shower Oil, Cherry Blossom Shower Gel, Shea Butter Hand Cream, Repairing Shampoo. Ultra-Rich body shampoo, and so on. Don’t miss out this favourite best seller every year! This year Crabtree & Evelyn features 6 Hand Therapy with limited edition on-the-go sizes that will quench dry skin and keep senses revived throughout the party season. It is a special collection that can extra twist to keep your skin soft and your party look on point. Do check out their website for more deets! One of the brand you could think ofduring this festive season definitely is Jo Malone. This year’s Jo Malone Christmas collection is more epic than ever. Mainly because they have launched an actual Gingerbread Biscuit perfume and also launching another brand-new scent White Moss & Snowdrop. There are many more other best seller collections including Luxury Cologne Collection, Christmas Cracker, House of Jo Malone, Miniature Candle Collection and more! Tarte’s collection is atropical-themed gift set featuring five best-selling products in all new shades. The Amazonian clay eyeshadow palette is stuffed with 24 exclusive new shades, ranging from soft, shimmery base tones to bright, bold colours, which are all designed to apply easier and last longer. It is also included Amazonian Clay Blushes, Amazonian Clay Highlighter, Amazonian Clay Bronzer, SexKitten Liquid Eyeliner & Tarteist Quick Dry Matte Lip Paint. This holiday, LANEIGE presents the Milkyway Fantasy Collection. This limited edition collection reflects the beauty of the enchanting universe in its sparkling packaging. This set specially packaged with mini essentials which are perfect for traveling in this festive season. Moreover, the preparation leading up to December can be intensive too.While you may not have the luxury of sleep, you can gift yourself the gift of rejuvenation while you rest. Why not ?